Joe Namath's daughter, Jessica Namath, was reunited with her lost dog after five years. Jessica Namath, the daughter of legendary QB Joe Namath, lost her Shih Tzu, Tula, over five years ago in Jupiter, Fla.
Over that time she had given up hope of ever being reunited with the dog that she loved. Then last Wednesday she received a phone call from a stranger that changed everything. It turns out the dog was found over 200 miles away in St. Petersburg, Fla.
Five years ago Namath, 28, daughter of football legend Joe Namath, was in the back yard of her former fiance’s home in Jupiter. Tula, her brown Shih Tzu mix, wandered to the front, which wasn’t unusual. But 10 minutes later Tula disappeared. Namath checked everywhere. Neighbors knocked on doors; she called the Highway Patrol and animal control; friends searched the canals in kayaks. Nothing. 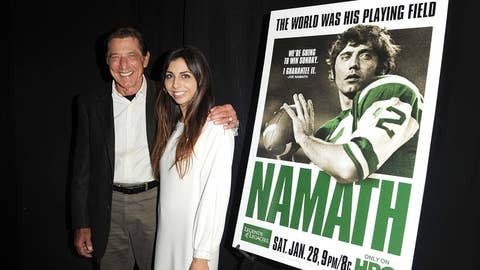 Namath posted a reward that climbed to $2,000. She called three psychics to help locate the dog. One told her Tula was definitely still alive. Then came Wednesday’s call. The voice on the other end was Michael Cecere, 42, of St. Petersburg. That afternoon he was running errands near 49th Street and 30th Avenue when the little brown dog ambled in front of his car. He scooped up the frightened animal and knocked on neighborhood doors, trying to find the owner. When that failed, he took it to ParkView Animal Hospital to scan for a tracking chip. There was a name but six bad phone numbers. Then he found the owner’s number on Facebook. "I could hear her jaw drop over the phone," said Cecere. So how did the dog end up so far away from home? According to the Tampa Bay Times, a family found the dog walking up a street in West Palm Beach a year after she had gone missing. Tula was in bad shape and the family was able to bring her back to good health. They later moved to St. Petersburg with their two young kids and the dog became part of their family. The dog recently wandered away from her new family’s house and was found by Cecere. The family posted an ad on Craigslist looking for their missing dog and were later contacted by the Tampa Bay Times after the dog was found and return to Namath. "It’s a huge loss for us," Yanelys Miranda told the paper. "But what can we do?"